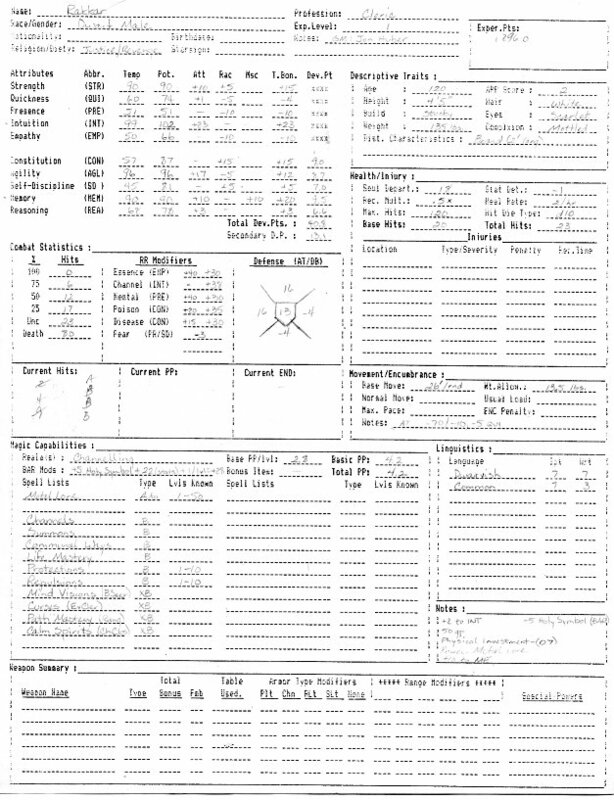 Instead of offering up one of the many relatively official character sheets made available over the years, I thought I’d upload one of the homemade sheets me and my circle of gaming confreres preferred, to give a better sense of how much detail and how many options were available. The sheets above included space for a selection of optional rules as well as the core rules: secondary development points, fractional power points per level, profession based skill bonuses per level for various skill categories… the list was almost endless. We typically allowed nearly every skill defined in the game as an option, and the GM (usually me) worked to make each and every possible selection viable and useful, so a 2 page list of skills was more the rule than the exception in our campaigns. While Rolemaster is, at first glance, a class and level-based system, it doesn’t take long to realize that classes are meant to guide you, not rule you, in the RM design. As one of my players put it once, classes in Rolemaster determine what you can be exceptional at, as opposed to what you cannot do. That is achieved by having a character’s selected class only determine the “development point cost” of buying levels in any particular skill, as well as how many levels of skill can be purchased at each level of experience. A Fighter can choose to learn the Stalk/Hide skill, for example: but the cost is 2/5, as opposed to the 1/3 for the Thief, or the lone 5 for the Magician. The Fighter must spend a full 7 (2+5) of his DP (of which he will generally get 30-40 per level, based on his attribute scores) if he wants to develop 2 levels of Stalk/Hide skill in a single experience level; the Thief needs spend of 4 to achieve the same, and the Magician is only allowed 1 skill level per experience level regardless, at a cost of 5. 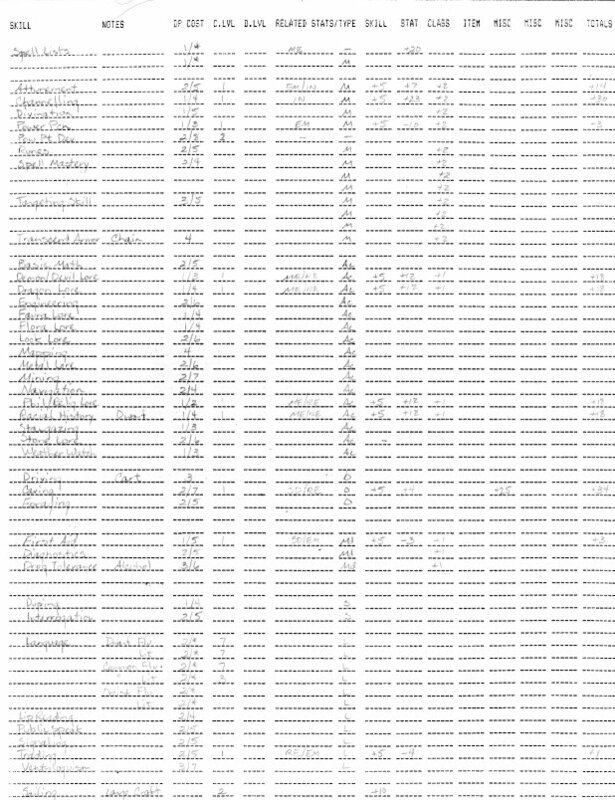 Another fond pastime of some of my players was evaluating the detailed weapon attack resolution charts of Arms Law to find advantages and faults. In combination with the underlying critical system, the detail allowed warrior-style players to make some attempt to tune their weapon selections to the specific situation as it evolved. Players would use 1 type of weapon against leather armors, and another against platemail. Searching for specific critical types and adjustments was commonplace. It was another case where the detail, right or wrong, made the players feel more empowered to make meaningful decisions… always a good thing, in my experience. For my part, I found that the critical charts, though only rarely as morbidly comical as the example above, provided a good amount of both incentive and inspiration to spice up the descriptions during all facets of play, combat included… which in turn added to the enjoyment of all involved. I found the magic system of Rolemaster to be fascinatingly inspiring in two ways. First was the sheer volume of options they found ways to express: between Open Lists, Closed Lists, Pure and Hybrid class lists, and various other permutations, and three, four, five complete styles of magic spread across almost 40 different classes by the time the expansions stopped coming… even though the basic mechanics were identical across all these options, the sheer variety created unexpected depth of play. The second intriguing aspect for me and many others I knew was in how they created all those options. Spell Lists like Essence Hand, Detecting Ways, and Lofty Bridges, each with some variation of selection even within those tightly defined concepts… taking even the mundane non-combat challenge and simply enhancing it with magic was still a relatively unexplored tactic at the time, and was surprisingly inspiring for many of the players I gamed with over the years. Despite more than a few fits and starts, and a reputation which has it referred to as “Chart-master” and “Roll-master” by many pen-and-paper gamers, Rolemaster is actually still alive and seems to be doing fairly well of late. Iron Crown Enterprises (ICE) is preparing to celebrate the 25th anniversary of Rolemaster during the coming year with re-releases of the original rulebooks in updated formats. ICE also sells .pdf copies of all it’s various products, all of which feature the type of variety and detail I so fondly reference here. 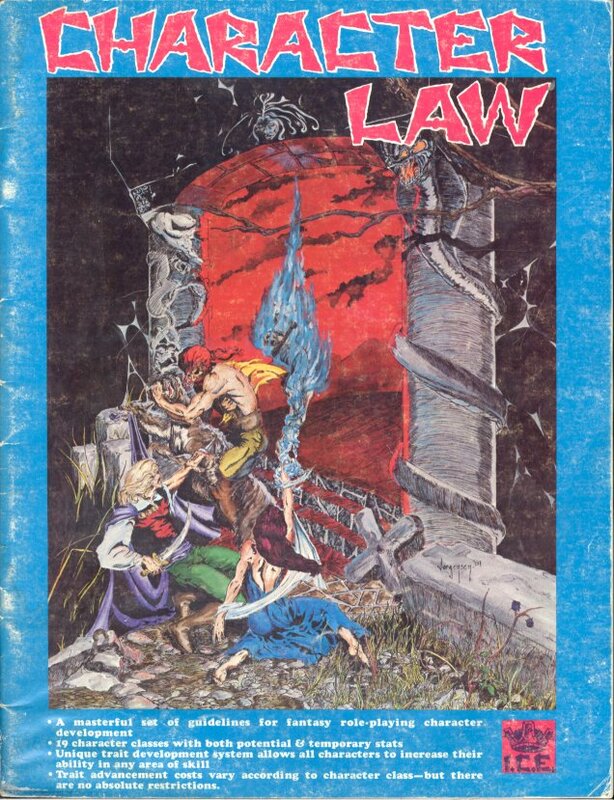 I would strongly encourage anyone with any interest in RPG design to head over and peruse their offerings, if you don’t already have them readily available. Excellent recap on Rolemaster. I remember playing it fondly. Thanks for the feedback, btw… nice to see people stopping by. The groups I played with and ran really loved RM. It had the flexibility we were looking for, and yet enough detail that we never got to the point of “been there, done that.” What more can you ask for, eh? I hope to have a mess of HAGIS (sp?) stuff up soon…. Thanks, and you’re in my blogroll as well. Perhaps not in such a prestige position (you have me between Chaosium and ICE). It actually inspired a post tonight for me. « Designing for the casual?